Robert Francis Goheen came to Princeton from India, where his father was a medical missionary. He graduated with the Class of 1940, Phi Beta Kappa, with highest honors in the humanities. Scholar, athlete, and campus leader, he was co-winner of the Pyne Prize, the highest general distinction conferred on an undergraduate. After completing a year of graduate study in the Department of Classics, Goheen entered the army. He served in the Pacific with the First Cavalry Division, reaching the rank of lieutenant colonel. When the war was over, Goheen returned to Princeton to continue his studies in classics. After additional work at the American Academy in Rome, he became a member of the Princeton faculty and, at the same time, director of the Woodrow Wilson National Fellowship Program, a nationwide effort to encourage young men and women to pursue careers in higher education. In 1956, while an assistant professor of classics, he was elected to the presidency by unanimous vote of the trustees. When he assumed office at the age of 37, he was the third-youngest president in the history of the University (after Aaron Burr Sr. and Samuel Davies). Although he repeatedly disclaimed any ambition to be known as a “building president,” Goheen saw more additions to the physical plant during his administration than any of his predecessors. During his first years in office, backed by a spirited campaign for capital funds, all the pent-up energies of Princeton — long constrained by the Depression and war — were released in a massive program of expansion. All told, Goheen nearly doubled the square footage under the campus’s roof. Among the more important additions were the Princeton University Art Museum, the Woolworth Center of Musical Studies, the School of Architecture, Robertson Hall, the Engineering Quadrangle, the Jadwin Gymnasium, the Computing Center, and the complex of Fine, Jadwin, and Peyton halls constructed for the mathematical, physical, and astrophysical sciences. With these came a parallel growth in student housing. Physical expansion was accompanied by a proportionate increase in the financial resources of the University. The annual budget quadrupled, from approximately $20 million to $80 million. More than 20 endowed chairs were added. The faculty grew from just under 500 to more than 700. There were more than two and a half times as many applicants for admission to the University in Goheen’s last year than there were during his first. Undergraduate enrollment increased by a third, from nearly 3,000 to almost 4,000; the number of graduate students more than doubled. The undergraduate program of study responded to what the president described as “an exploding, booming, shifting world of knowledge and ideas.” Provision was made for sophomore concentration, a reading period at the end of each term, a University Scholar Program that offered exceptional flexibility to carefully selected undergraduates, and student-initiated seminars. In the area of student life, a number of social facilities were established to complement existing options. One of the new facilities combined two former club buildings into one University-managed hall named for Adlai Stevenson of the Class of 1922. (It became the home of the first kosher kitchen on the campus.) Two major residential colleges, Princeton Inn and Woodrow Wilson, offered dormitory, dining, and social facilities for 400 to 500 students each. Among the most momentous changes to be made during Goheen’s tenure was Princeton’s transition to coeducation. During the 1960s, the University began to actively encourage minority students to attend. Princeton’s long-range commitment to ethnic and racial diversity was symbolized in the creation of the Third World Center, dedicated by Goheen in 1971. It is now called the Carl A. Fields Center for Equality and Cultural Understanding. 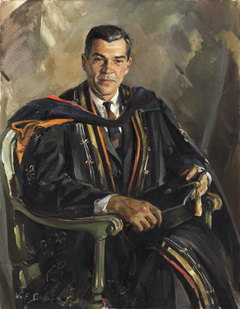 Robert F. Goheen (1919–2008), Class of 1940, Ph.D. 1948.